Using a tax preparer? Need your refund sooner rather than later? Be wary of “refund anticipation loans” (RALs) and “Refund Anticipation Checks” (RACs). Gaccione noted that if taxpayers file their returns electronically and use direct deposit, they can get refunds in 10-14 days without paying any extra fees for what is essentially a loan. These same people also may qualify for the federal Earned Income Tax Credit – and free help with tax preparation. For further information go to westchestergov.com/eitc or call United Way’s 2-11 help line. RALs are bank loans secured by a taxpayer’s expected refund -- loans that last about 7-14 days, the time it takes to process an IRS refund. In tax year 2008, 7.2 million American taxpayers took out RALs. The end result, he said, are effective annual interest rates ranging from 50 percent to 500 percent. What is a Refund Anticipation Check? RACs are a newer product, offered to people who don’t have a bank account. The bank opens a temporary account into which your IRS refund goes. Then the bank issues a check or prepaid card to you and closes the account. You will be charged an administrative fee for the account and then may be charged to cash the check you receive from the bank. For tax year 2008, 12.9 million ? taxpayers received a RAC. “Another bad idea,” said Gaccione. Don’t take out an RAL or RAC. Instead e-file with direct deposit to your existing bank account. You provide your account number right on your tax return. You can get a refund in about 10 days this way - without paying one cent extra for a loan. Wait just a bit longer. 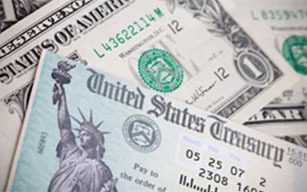 Do you really have to get cash from your tax refund today? Can you wait a few weeks to save almost $100? If you have an urgent bill to pay, ask for more time until the tax refund check comes from the IRS. Don’t take on a new expensive debt to pay an old bill. Get a bank account. If you don’t have a bank account, open one to take advantage of direct deposit. If you are a person of modest income, find out if you qualify for the EITC. Call 2-1-1. If you do qualify, trained volunteers will fill out your taxes for free. New York State Law requires tax preparers provide a copy of the “Consumer Bill of Rights Regarding Tax Preparers” to any consumer using a tax preparer. Visit the Financial Education pages for more tips on getting the most out of your money.